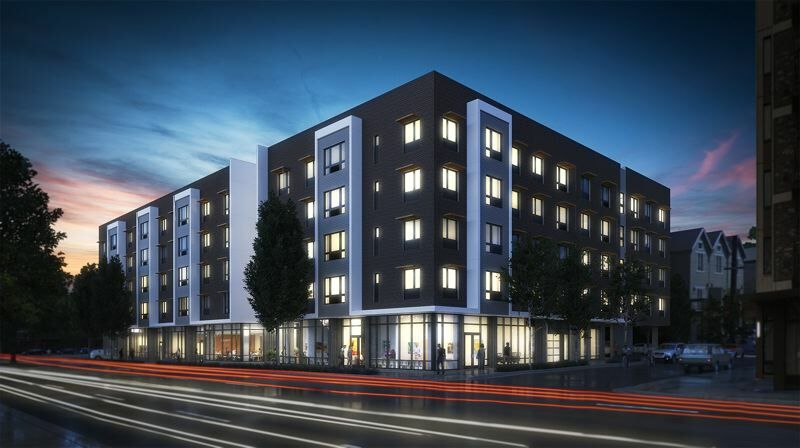 Portland Community Reinvestment Initiatives' new project offers affordable housing now, home ownership later. 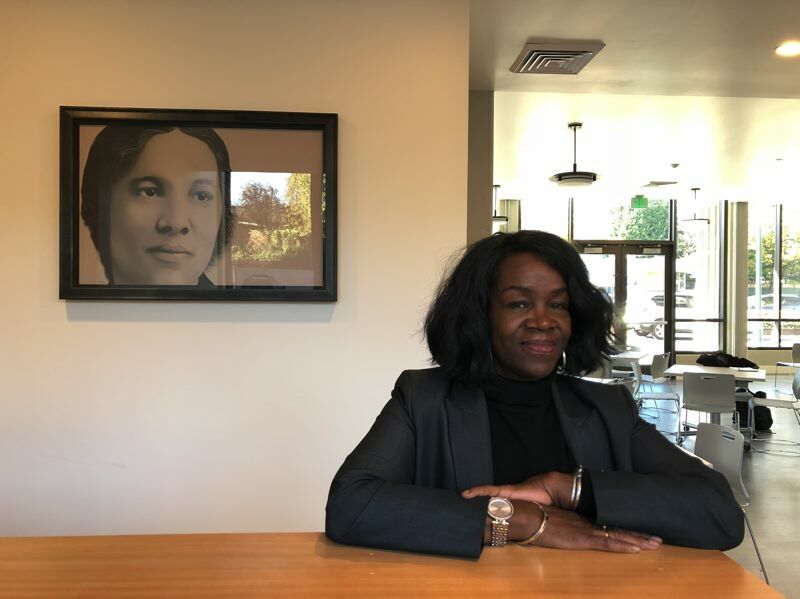 Even though Beatrice Morrow Cannady lived in Portland in the early 20th century, the presence of one of the first African-American women in the country to graduate from a law school is apparent in a new affordable multifamily project in the northeast Portland Eliot neighborhood. Intricately detailed drawings by local artist Eugene Yakolev that depict Cannady at various stages of her life hang throughout the ground floor of the building. Her name graces a sign on the side of the structure. Even the purpose of the building — to return a largely African American population to a neighborhood they were forced to leave due to gentrification — reflects Cannady's passion and mission as a civil rights activist fighting for equality for Portland's black community in the early 1900s. 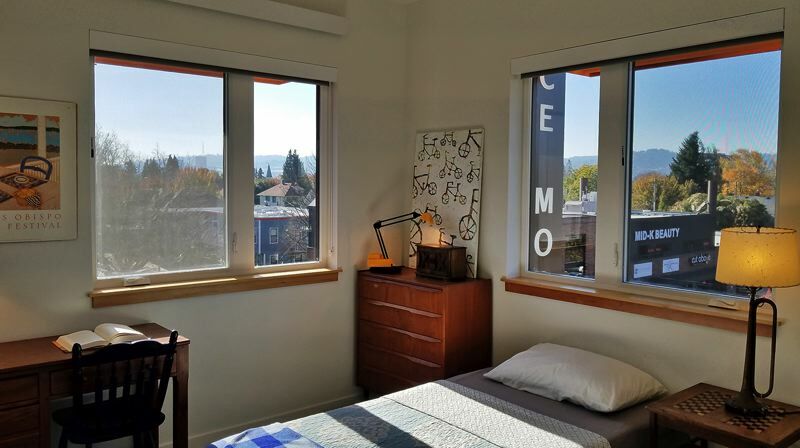 The 80-unit Beatrice Morrow Building is the latest — and largest — housing project that Portland Community Reinvestment Initiatives Inc. has tackled since it began providing affordable housing for low-income Portland residents and helping families realize their dreams of home ownership. Over the years, guided by the real estate experience of executive director Maxine Fitzpatrick, PCRI has built an impressive portfolio, fixing up properties that previously had belonged to a company called Dominion Capital as well as building new small developments of duplexes, triplexes and apartments — all with the goal of providing African-American families and other low-income residents in Portland with home ownership and affordable housing opportunities. Several of the projects have won awards, including Governor's Livability awards. Fitzpatrick says her organization tried to build larger projects when the city issued RFPs for affordable multifamily projects. But despite its proven track record, the group was turned down. "The city said we didn't have the capacity," Fitzpatrick said. That changed when Fitzpatrick received a call from Gerding Edlen in 2015. Three years ago, the city of Portland issued a request for proposals to build affordable housing on a piece of property in Northeast Portland that had been occupied by Grant Warehouse. Gerding Edlen wanted to work with Fitzpatrick's organization on a proposal. The partners triumphed over tough competition, and planning began on what would become the $27-million Beatrice Morrow building. The Portland firm of Carleton Hart Architecture was brought on as project architect while the minority-owned firm Colas Construction joined as general contractor. Carleton Hart has become a common name on area affordable housing projects, which make up about 40 to 50 percent of the firm's work, according to co-founder Bill Hart. 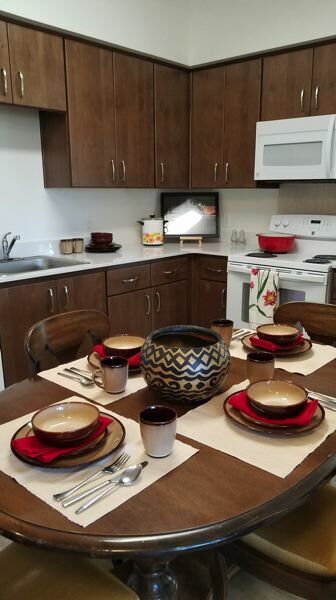 The Beatrice Morrow is unique because most affordable housing projects usually consist of studios and one-bedroom units, said Hart, who served as principal-in-charge for the PCRI project. Larger apartments are rare. But about half of the units at Beatrice Morrow are two- and three-bedroom units to accommodate families. The unit breakdown includes four studios, 32 one-bedroom and 32 two-bedroom apartments, and 12 3-bedroom apartments. One portion of the units will be available for tenants making 30 percent of the area median family income while a second portion will be earmarked for people making 50 percent. The remainder will be for people making 60 percent of the area median family income. For Martin Segura, who served as Carleton Hart's project architect, the opportunity to create the family-sized residential units was one of his favorite parts of the project design. "When you see in your mind that's where the television is going to go ... thinking that's going to be a home, that's one of my favorite parts of this particular project," he said. The ground floor of the building contains a central community room with a kitchen area. 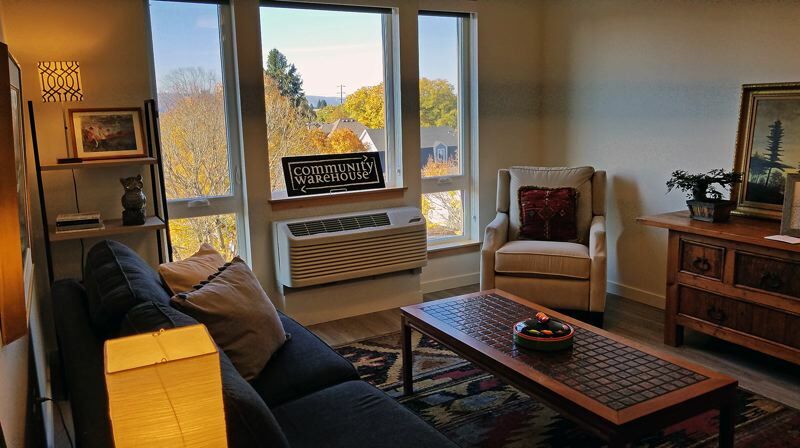 In addition to serving as a place where classes can be held for adult tenants and after-school activities conducted for children, the room will provide much needed meeting space for neighborhood gatherings, large meetings and events, Fitzpatrick said. Those groups used to use space in a building in the neighborhood that was the headquarters of the Oregon Association of Minority Entrepreneurs until that organization moved to Swan Island. Located on either end of the community room are retail spaces. One space has already been leased by an organization and the search is on for a tenant for the second space, Fitzpatrick said. As part of a commitment to mentor small, minority firms, Carlton Hart has tapped Portland architectural firm LEEKA Architecture and Planning, owned by Neil Lee, to handle interior designs for future tenant improvements for the retail spaces. The building also features an abundance of glass, which allows natural light to flood the main lobby and community room. Located on what Hart says is a "long block," the design team kept the building's mass from overwhelming single-family homes nearby. They reduced the height of the building and moved it closer to Martin Luther King Jr. Boulevard. Designers also inset a main entry way, creating visual interest that was reinforced by vertical white elements that go up, over the top and down the sides of the building, breaking up a stretch of brick wall. "We didn't want to create something that would be imposing ... we brought in as much detail as possible," Hart said. While Fitzpatrick's group owns the Beatrice Morrow, the Portland Housing Bureau is handling filling the apartments with tenants. Preference is being given to individuals and families displaced from their former homes in the city due to gentrification, a city policy that Fitzpatrick says was fashioned after a plan her organization created called "Right to Return." Fitzpatrick points to five separate situations in which African Americans and other low-income residents in the city were forced out of what she says were the "only areas they were allowed to live freely in the city" as a result of development and subsequent gentrification. The first displacement occurred when the city of Vanport flooded, Fitzpatrick says. Additional displacements occurred to accommodate a freeway project, the construction of Memorial Coliseum and expanding Legacy Emanuel Hospital. The most recent was around 2000, when the route for the TriMet MAX yellow line was being planned. The project led to the displacement of 10,000 people, Fitzpatrick said. With an eye toward finding a remedy, the city created the Interstate urban renewal area and promised to build 5,000 housing units there for people — mainly from African American communities — who had been affected by the project, according to Fitzpatrick. "The city failed to meet its promises," Fitzpatrick said. Frustrated with the lack of follow through, Fitzpatrick sat down a few years ago and decided to come up with a plan of her own to provide at least some of that housing. 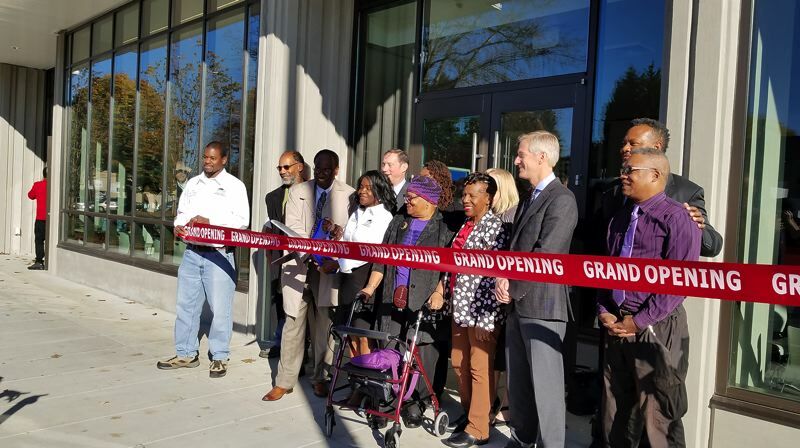 The result, Pathway 1000, calls for PCRI to build 1,000 units of housing in the form of 200 affordable apartments and 800 home-ownership opportunities for African Americans and other low-income Portlanders in the neighborhoods they have been forced to leave over the years. The organization will use equity it has built up in its properties to pay for construction, Fitzpatrick said. Once the homes are sold to low-income and displaced families that PCRI has worked with, the money from the sales will then be reinvested to build more houses, until the goal is met. Fitzpatrick estimates a 1,600-square-foot home will sell for approximately $200,000. The 80 apartments at the Beatrice Morrow are part of the Pathway 1000 tally, as are the two five-plexes — properties that will be available for home ownership — being built on land PCRI owns not too far way. An apartment at the Beatrice Morrow isn't intended to be an end point for most residents, according to Fitzpatrick. The idea is that PCRI will eventually residents to move into homes the organization will build and sell to them. The goal is to have at least 75 percent of the families that rent units in the building move on to home ownership with the help of PCRI, Fitzpatrick said. As part of that journey, PCRI will offer classes in financing and budgeting to families. "We're getting families prepared for home ownership," Fitzpatrick said. "This gives them a chance to be able to move up in income. When they don't qualify for this housing [because their income level is too high], we're going to keep working with them."